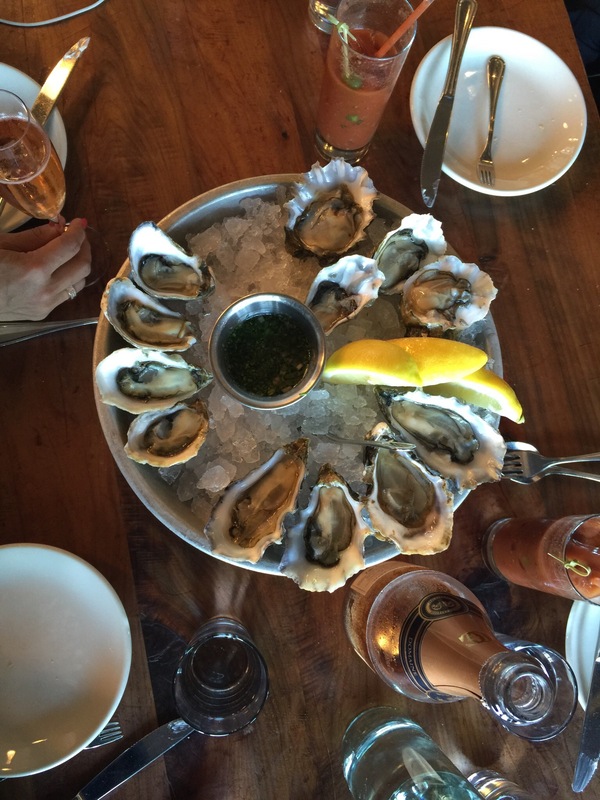 Have you been to Hog Island Oyster Co. in the San Francisco Ferry Building? I have and I love it. They have outdoor and inside seating and the oysters are fresh! After the Bay to Breakers, we decided to go to Hog Island since the Hotel Vitale where we are staying is right across the street from the Ferry Building. Took a selfie while standing in line for a seat. 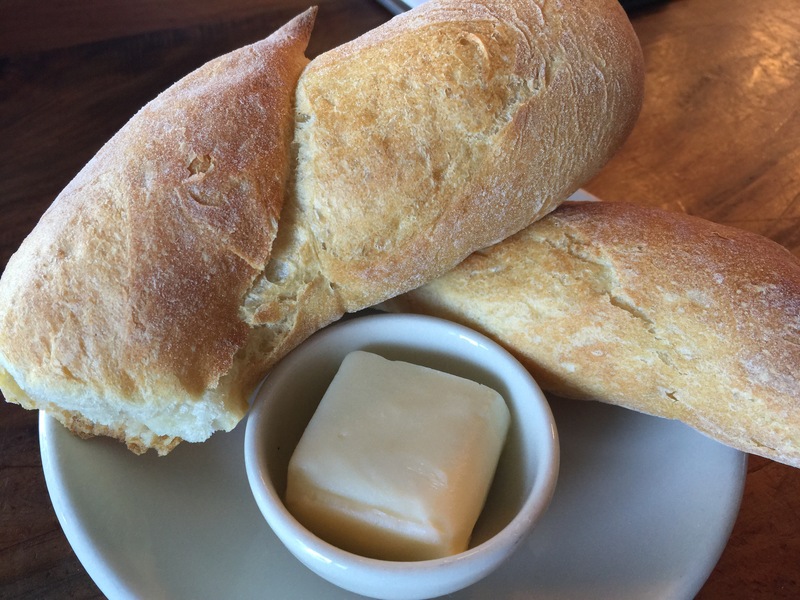 The server brought warm crusty bread to our table to snack on as we waited for our food. Just like all the other restaurants we went to, we ordered family style here too. 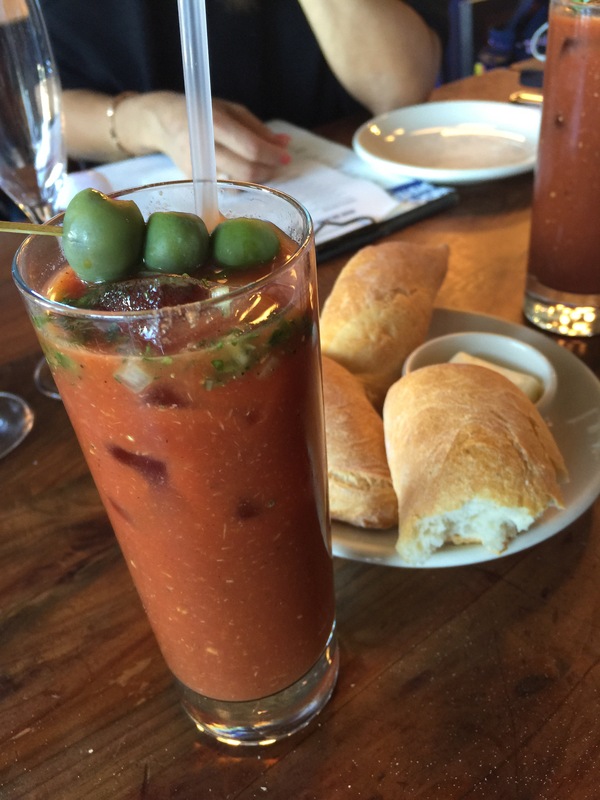 I ordered a Hog Island Bloody Mary that was delicious. This could have been a meal in itself for me. It had vodka, organic tomato juice, Tabasco, and something called Hog Wash. I asked the server what hog wash was. Turns out that it is the sauce they bring for dipping the oysters in. They have the recipe on their website! It is delicious and went really nicely with the Bloody Mary. What a nice way to rehydrate after the Zappos Bay to Breakers 12K. We had an assortment of three different kinds of raw oysters. They were incredibly fresh and tasty. We had the Hog Island Sweetwater, Kumamoto, and one more oyster that I can’t remember the name of. If you go, just tell the server which kind of oysters you like–big, small, briny, sweet and your server will make some recommendations for you. 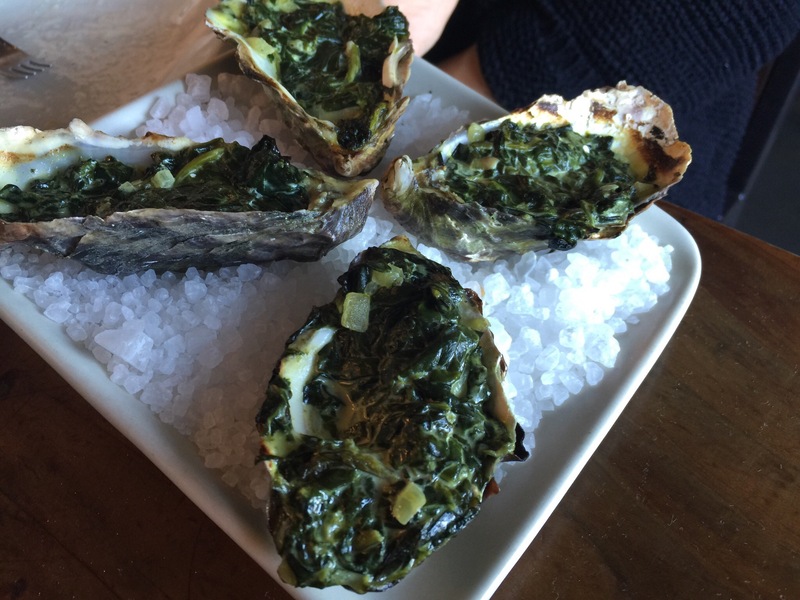 We ordered the Rockefellers that were made with local spinach, sweet onions, lemon zest, Pernod, and cream. The chowder hit the spot. This is a thinner broth than the kind that we are used to in Hilo but still delicious. 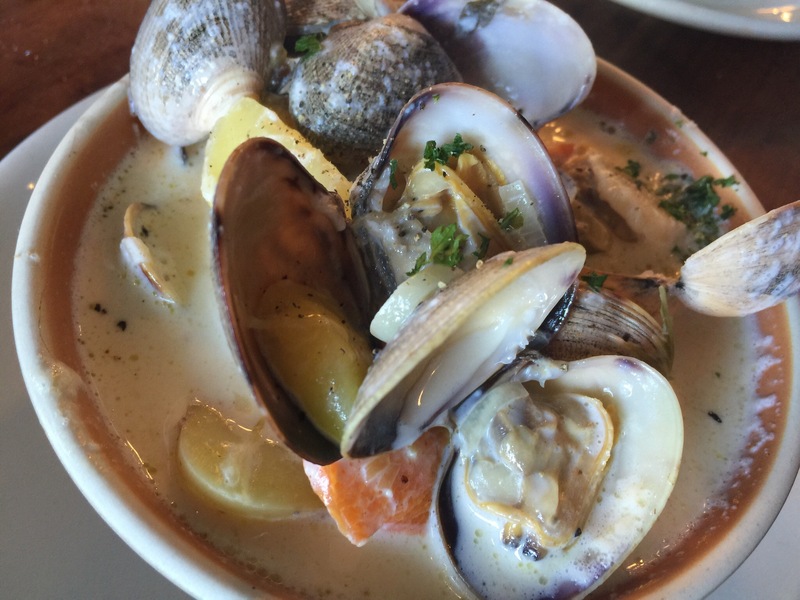 It had Manila clams with aromatic vegetables, bacon, potatoes, and cream. The grilled cheese was recommended to us by so many people. It is a rich and creamy sandwich. 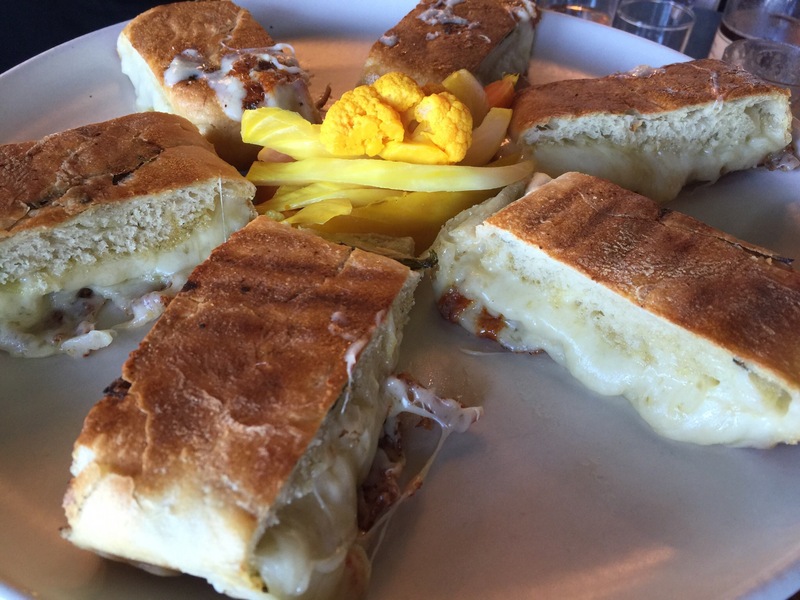 The kitchen accommodated our request to have it cut in smaller pieces so that we could share this filling sandwich. This sandwich had Cowgirl Creamery’s fromage blanc, Vella mezzo secco and cave-aged Gruyere, served with house made pickles. Thank goodness our slices were smaller than usual. I wouldn’t have been able to finish a larger serving. If you go to San Francisco, go to the Ferry Building Marketplace and check out the shops and restaurants there. Go on a Saturday so you can browse the farmer’s market there with so many local products available for purchase. Final note: On a previous trip, I had the rustic seafood stew that I loved. It has a variety of seafood served in a spicy herb tomato broth and is reminiscent of a cioppino. Yum! 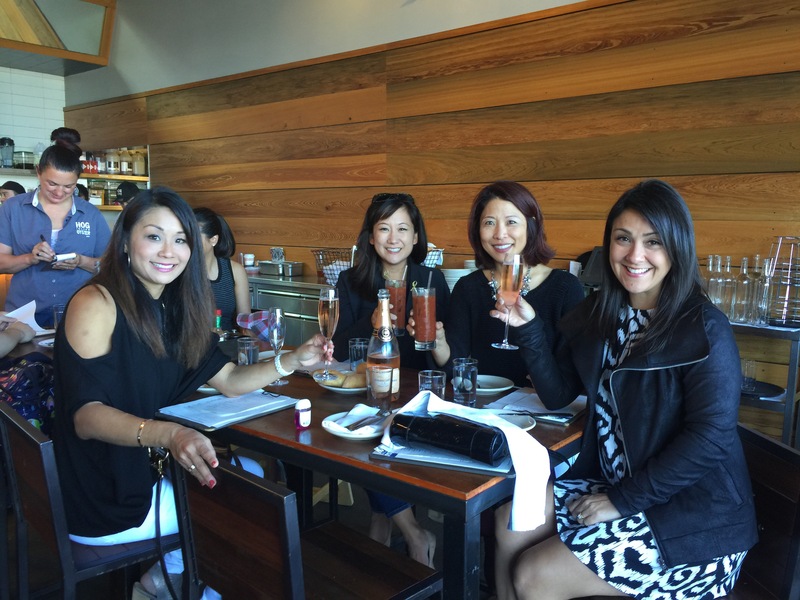 Can you suggest other favorite places to eat in SF? Can’t wait to go on my trip in September. Hi JT! You’re going to have a great time in SF. There are so many great places to eat in SF. Where are you staying? I have a few more posts coming up about where we ate in SF. We loved Hog Island. Liholiho was awesome. S would enjoy Gary Danko and Boulevard. Dirty Habit was hip and cool. I loved eating dim sum in Chinatown. I heard State Bird and Progress are great.